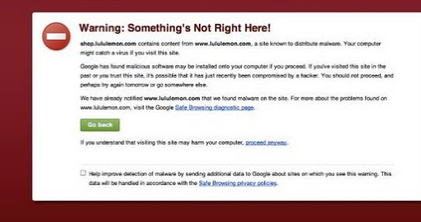 Further to my earlier post about the hacker virus warning on the Lululemon website, someone posted an image capture of the warning message she got from her virus software while browsing the Lululemon.com website. Several other people have confirmed also getting this warning message but not everybody is seeing this message. Another customer has reported having a malware virus infected her computer shortly after going on to the website (she did not get the virus warning). Her husband who is in IT was able to repair her computer for her and identify it having a trojan. Unfortonately these types of breaches happen to large retail websites all the time and there is probably nothing Lululemon could have done to prevent this, all they can do is let customers know that there has been a breech. Our only recourse now is to use our own due diligence and remove our stored credit card information from the website if you keep it stored (although probably too late) and keep vigilant of activity on your credit cards. **Perhaps it’s best to not log onto the website for now and rely on the Lululemon Facebook Page for further information which I will repost here**Run anti virus software on your computer and if you have a Mac, don’t think that your computer is immune to viruses because I’ve had a virus on my Mac in the past. It was a simple fix when I realized what it was and identified the issue on the Apple.com website which also gave instructions on how to remove the malware. The virus that the lululemon customer has described today is pop up screens telling her to buy antivirus software. The pop ups kept coming up and multiplying on her causing her computer to crash. If this has happened to you or your computer also gave you a virus warning on the lululemon website please share in the comments section. "New! I Love Hockey and Om Advantage Shirts"
"New! Pigment Blue Swiftly Tech"
I have a Mac and it happened to me! I had a pop-up come up for every single page I visited that I had to close before I could move on. I finally gave up and turned off my computer…it was so frustrating!!! Something is definitely wrong and macs are NOT immune here… Sorry lulu….your website has had so many issues…time to hire competent people. I have had issues with this website from day 1.